Last summer, we did a roundup of Facebook features you may have missed in the past couple of years. In mere six months, however, Facebook marketing has seen even more changes, with some designed specifically to address the demands of advertisers on the network. We have discussed the most drastic of those changes, the potential decline in organic reach on Facebook, as well as ways to battle it. Recently, Facebook announced another round of similar changes aimed to improve user experience, and show users more content from friends instead of brands. However, while reducing the number of promotional page posts that appear users’ News Feed, Facebook has added robust new features for paid social advertising. To get you up to speed on all the latest Facebook features that influence your social media marketing strategy, we go over some things businesses can do with the latest advertising, video, and Facebook Messenger updates. Advertising on Facebook has many advantages: it can help spread awareness of your brand to new audiences, deliver content to your target demographics, and increase traffic to your Page and your website. In February, Facebook launched a new type of advertisements to help businesses connect with customers: Product Ads. The new feature allows brands to upload their entire catalogue of products, and then create separate campaigns for each product. Alternatively, advertisers can let the social network target the ads automatically to show the right product to the right audiences. Furthermore, the new type of ads can be targeted to reach audiences at various stages of the customer journey—for example, by targeting people who have previously visited the brand’s website. The social network also allows brands to create multi-product Facebook ads that highlight several products from the catalogue, or several benefits of the same product. This helps businesses showcase their product selection, and encourage customers to browse through the products directly on Facebook. A significant part of the advertising overhaul on Facebook’s part has been focused on automating the process. It allows for the bulk of the work to be done in the creation stage—such as selecting the product, setting the right targeting parameters, and designing the ad—and then setting up a template for future advertisements based on the success of the first few cycles. The new dynamic ads template allows for content to be automatically optimized for mobile, tablets, and desktop. As I mentioned before, the new product ads have enhanced targeting capabilities that allow businesses to zero in on very particular user demographics. 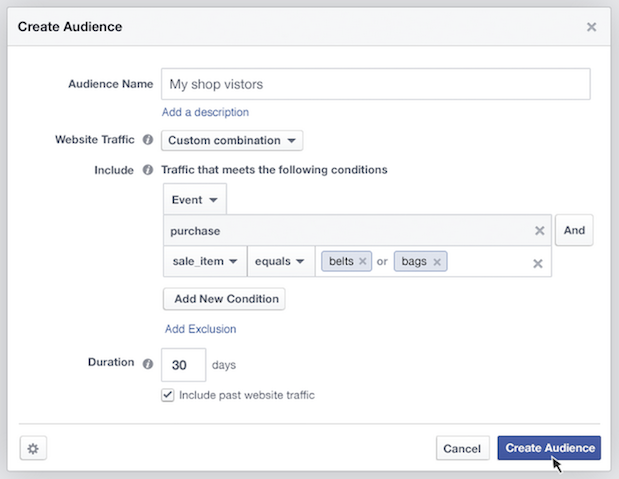 The new Custom Audiences tool lets you create several audiences based on their behavior on your brand’s website, such as the pages they visited or the amount of time passed since their last visit. The tool also lets advertisers target customers based on their purchase history: For example, if a customer has bought shoes from a retailer, they might see advertisements about accessories. Testing different formats of Facebook ads is vital for improving their performance. Copy of the sponsored posts, images associated with them, call-to-action buttons—all of these can be tweaked to see how much the change affects conversion rates. In the beginning of April, Facebook data scientists have released an open-source collection of tools for online experiments, including A/B testing. This set of tools, called PlanOut, helps managing sets of experiments with multiple factors, and tie outcomes to different conditions. 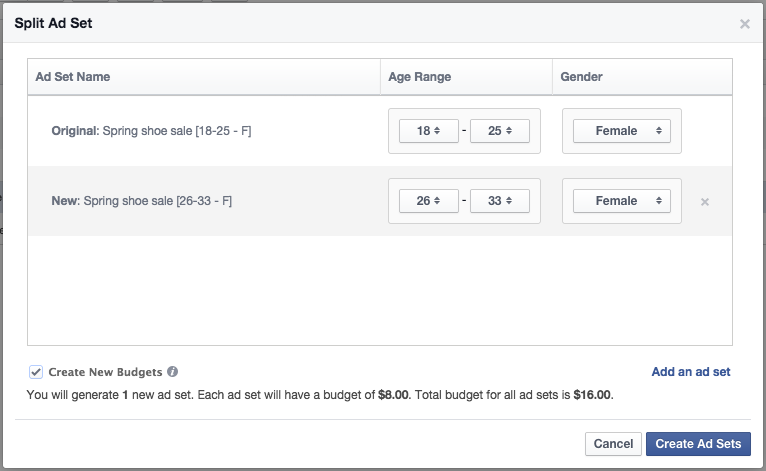 For advertisers who are satisfied with the simpler A/B tests, Facebook offers an audience-splitting tool for advertisers. When testing ads this way, brands don’t have to change the content of the Facebook ad—only the demographics of the audience that sees it. This allows you to test how the ad performs when targeted to user groups in specific age or gender categories. Facebook doesn’t want users to have to go outside of the network to transfer payments. 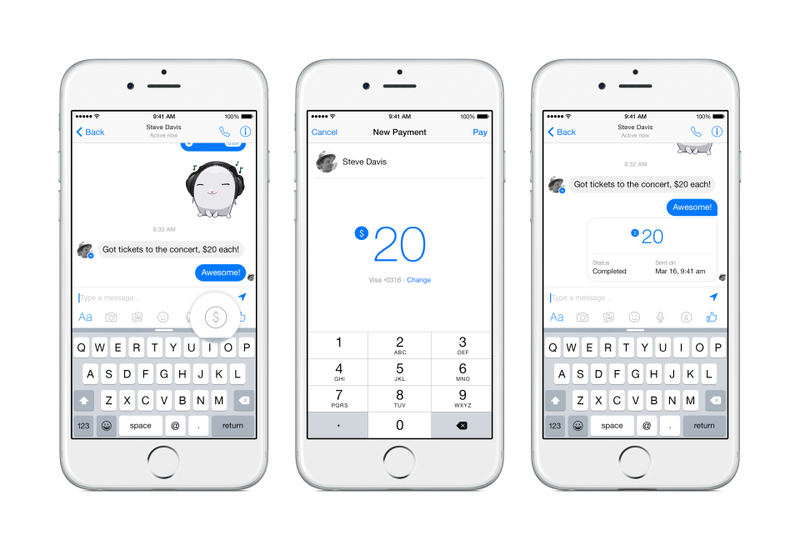 Now, some users can start transferring payments to Facebook friends over Messenger—at no cost. All you have to do is enter your debit account information into the system, then tap the ‘$’ symbol and type in the amount you want to transfer, and hit Send, as you would with a message. For brands, peer-to-peer payment options present a huge e-commerce opportunity down the road. Facebook developers have hinted about a future possibility of communicating with customer service representatives and purchasing products without leaving the News Feed. 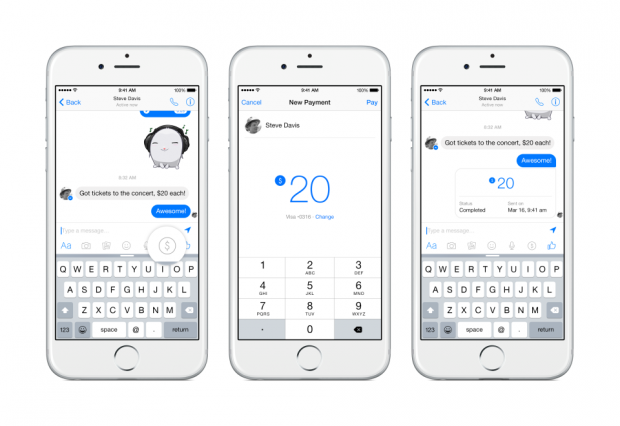 While the payment feature is still in the testing stages, brands can adjust their Facebook strategy for maximum engagement: whether this means assigning team members to respond to comments and private messages sent over the network, or setting up a forum-style app for the Facebook Page to encourage exchange of ideas and real-time troubleshooting. 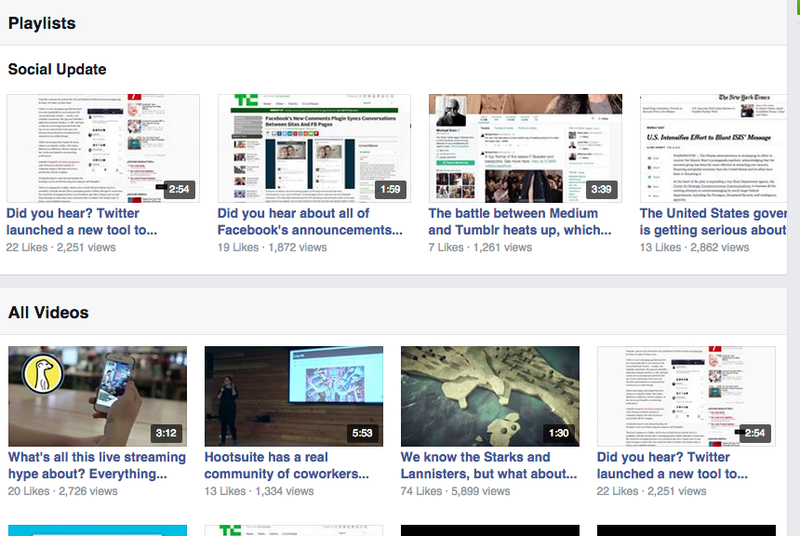 With the introduction of native video on the network, Facebook has really given YouTube a run for its money. Content creators who previously used YouTube as their primary platform to realize their social video strategy can now create, embed and promote video on Facebook. Plus, it’s a great way to bring new users to your brand’s Facebook Page. So if you haven’t included Facebook in your social video strategy yet, these new features might just convince you to do so. Recently, Facebook announced that videos from the network can also be embedded externally. This smart move on Facebook’s part encourages more creators to host content on the network. For advertisers on the network, this means using appealing video content to attract users to their Facebook Page—cutting out the middle man that was YouTube or Vimeo. Another important video feature now available for brands on Facebook is the ability to create video playlists. If your social video strategy includes different kind of videos—for example, tutorials, news updates, or interviews—sorting them by type can help increase the users’ awareness. Grouping videos by playlists helps users discover the kind of content they are looking for; plus, having a list of related content encourages users to keep watching your videos. Finally, if your brand is launching a social media campaign that includes a video element, Facebook allows you to highlight certain uploads by placing them on the ‘Featured’ spot. This is the first video that a visitor would see when they visit the Video tab on your Facebook Page. Since the featured video is placed in such a prominent spot, make sure it highlights the best parts of your brand. In addition to all the new Facebook features that have already been launched or have begun rolling out to smaller samples of users, we got a sneak peek of other features to expect in the future during F8, Facebook’s annual developer conference. For example, in addition to bulking up its video functions, Facebook promised to soon allow 360-degree videos to be uploaded on the network. Advertisers on the network can also expect some favourable expanded capabilities. One of the main areas of focus for Facebook is the Messenger, which has been undergoing a transformation from a single-purpose app to an entire platform, complete with its own app directory, and added capabilities such as payments and live support chat. The latter set of features makes up an entire category, Businesses on Messenger, which is designed specifically to facilitate the interaction between brands and their customers on Facebook. Read our F8 announcement summary to get a better idea of upcoming Facebook features worth keeping an eye on. 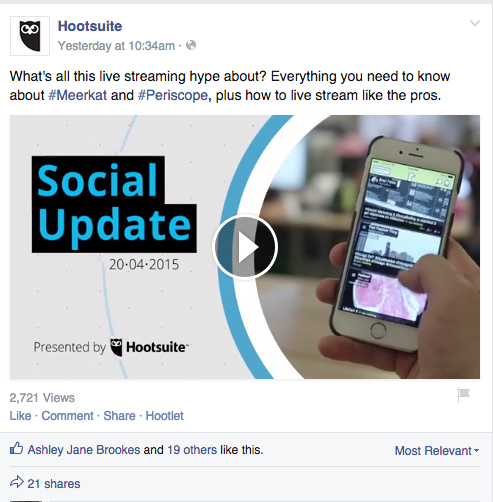 Save time managing your business’s Facebook Page with Hootsuite Pro—it’s free for a month!